What are new librarians reading? We recently had a future librarian from Dalhousie visiting our department and I asked her, what have you read lately, and are you willing to write a review of it? Her answer was a definite YES! She decided to review Kathleen Duey's Skin Hunger. "Kathleen Duey’s Skin Hunger is a dark fantasy novel that is the first in her planned trilogy entitled A Resurrection of Magic. As summer in Halifax approaches, it is the perfect time to escape the realities of work and school and indulge in the twisted and fantastical world that Duey creates. Never in a fantasy series has magic been portrayed as such a terrible gift and never have magicians been depicted as such merciless and cruel beings. The book traces, over two different time periods, the engaging and well-developed characters of Sadima and Hahp as they face the cruel realities of living in a world where magicians and kings fight over the right to rule with magic. 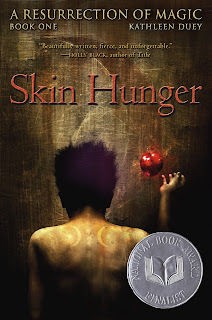 Though primarily for young adult readers ages 16-18, Duey’s Skin Hunger has considerable crossover appeal. For adults who secretly enjoyed Stephanie Meyer’s Twilight series, or who delighted in Holly Black’s Tithe: A Modern Faerie Tale, A Resurrection of Magic will be doubly more appealing because of its beautiful writing, intense characterization and fierce and unforgettable storyline. It's refreshing to see what other people are reading, and to hear other readers' perspectives. And, I like to hear about other "cross-over" novels like the Twilight Series. Are any of you aware of other cross-over series or novels that you can recommend? It was indeed a bizarre portrayal of magic. I very much enjoyed the book. However, the title implies that there might be more books to follow. I have seen no implication of sequels. I'll check out the others.